The leatherback sea turtle is the world’s largest reptile. It is significantly larger than all other marine turtles. The leatherback’s body is teardrop-shaped, tapering at the rear to a blunt point. The carapace, or upper shell, can grow to more than 2 m in length, and the turtle can weigh more than 900 kg. Range: The leatherback seaturtle ranges further than any other reptile, with single turtles migrating across entire ocean basins. Leatherbacks can be found in the tropical, temperate, and boreal, or northernmost, waters of the Atlantic, Pacific, and Indian oceans. They are also found in the Mediterranean Sea. Habitat: Leatherbacks are powerful swimmers, covering enormous distances in relatively short periods of time. Leatherbacks are one of the world’s deepest-diving vertebrates. The maximum recorded dive depth for a leatherback is 1 270 m. Like all reptiles, the leatherback breathes air. Although it is able to stay under water for more than an hour, a leatherback usually does not spend much more than half an hour beneath the surface. Diet: The primary reason that leatherbacks migrate north is to feed on jellyfish, which are their principal prey. The turtles will also eat other soft-bodied creatures, such as salps. Salps are soft-bodied, gelatinous, free-swimming marine invertebrates with a transparent barrel-shaped body. Like almost all reptiles, leatherback seaturtles hatch from eggs laid on land. 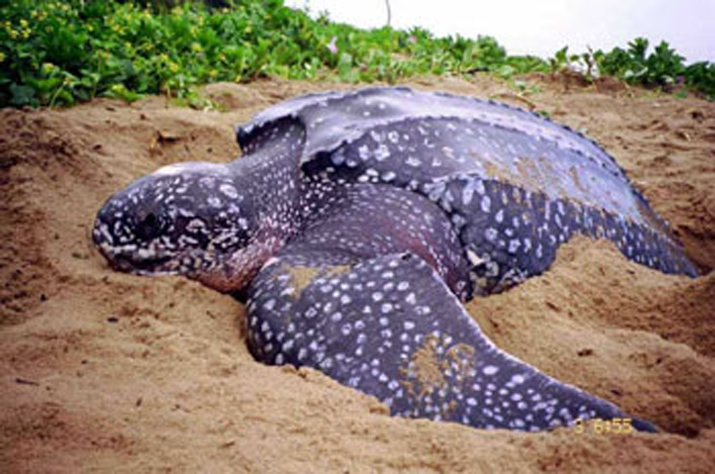 The major leatherback nesting beaches are in Trinidad, French Guiana, Suriname, St. Croix and the United States Virgin Islands, Papua New Guinea, Mexico, Pacific Costa Rica, Irian Jaya, and Gabon. They do not nest in Canada. In the United States, the turtles nest in Florida and occasionally in Georgia. Nesting is the only time a sea turtle will return to land, and only the females nest. Male turtles never return to land after hatching. Mating takes place at sea. Leatherbacks nest every two to three years. Atlantic leatherbacks nest an average of six times from March to July, with approximately 10 days between the nesting episodes, while Pacific leatherbacks are thought to nest fewer than five times between September and March. To lay their eggs, almost all leatherbacks will return to the beach where they themselves hatched. The leatherback sea turtle is likely the fastest growing reptile in the world. Starting their lives as 40- to 50-gram hatchlings, leatherbacks grow 10,000 times this size over the course of their lives. 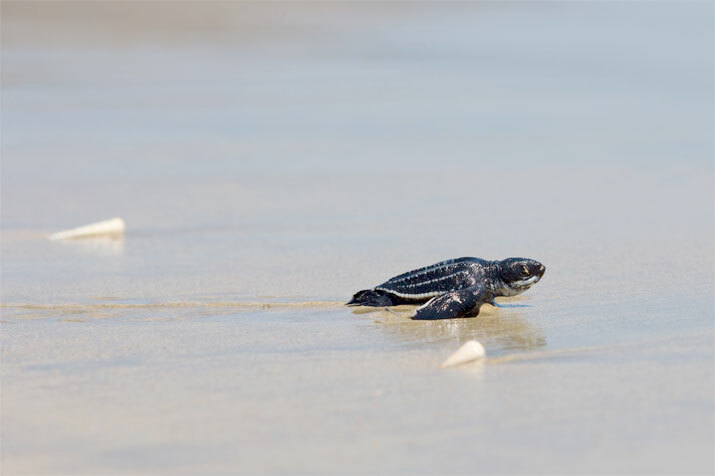 The leatherback sea turtle population faces extreme challenges as an endangered species in Canada, but did you know that many of those challenges can occur before the hatchlings even reach the water’s edge? Leatherback sea turtles migrate farther than any other reptile on Earth. En route to nesting and feeding grounds, they can travel across entire ocean basins, including the Atlantic, Pacific and Indian oceans.